The message of this book is that the cosmos is much bigger, and much stranger, than you might have thought. Indeed, it is bigger and stranger in ways you probably have not thought about — even though you are a reader of Plus, and so of course both very clever and very imaginative! Tegmark argues that it is bigger and stranger in four main ways, each one building on the last. Each represents such a vast extension of what we usually call the cosmos (or Universe) that he suggests we should use the word multiverse for these extensions. So he calls the first main way it is bigger — the first main way he wants to surprise and unsettle you — the level I multiverse. Then the second main way is the level II multiverse; and so on till we get to the level IV multiverse. But fear not: Max Tegmark is not only a gifted and distinguished cosmologist. 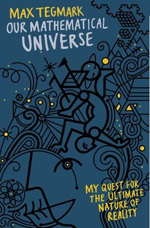 He writes clearly and wittily about all the mind-bending ideas which his book expounds: not just the established physics of relativity, cosmology and quantum physics, but also the controversial possibilities — those four main ways for the cosmos to be bigger and stranger than you would have thought — that he wants to convince you about. Besides, he combines all this science with personal anecdotes about his own life and times: from his growing up in Sweden, to his later career in the USA. Thus the book begins with a nearly fatal bicycle accident which happened when he was a teenager (and the various quantum mechanical ways it might have been fatal! ); and throughout the book, there are various anecdotes, for example about meeting the amazing Princeton physicist, John Wheeler. In short: ideal for readers of Plus. So let's have a look at his ideas. Level I is rather like the idea that maybe, when you were born, you were one of two twins — but the other twin got separated from you at birth, to be brought up far away, so that you never had the chance to meet each other. Except that for Tegmark's level I, the birth in question is not yours, but the Universe's! The suggestion is this: at the Big Bang there could have been pieces of matter that went off in another direction than did all the matter that went on to form our galaxy — and moreover, in a different direction from all the matter that makes the Universe we can now observe — or even, will ever observe. Could that be so? Well, the Big Bang is a tough topic to understand in detail! But a framework for understanding it, called inflationary cosmology, answers: Yes, it is so. And there are not just a few 'lost twins' of bits of early matter, but countlessly many: each of them zooming off, never to be seen by us, and also never to be seen by almost all other such bits of matter — or rather, by whatever observers those bits of matter might eventually aggregate into". So inflationary cosmology proposes separating the children from one another at birth on a truly cosmic scale! But how much should we trust inflationary cosmology? There is good news and bad news. The good news is that in the thirty years since the idea of inflation was first invented (in about 1980), it has had several theoretical and even observational successes (see for example this Plus article). So much so, that it is now physicists' orthodox view of the very early Universe. The bad news is that — as always — we should also listen to the counsel of caution, the voice of scepticism. It says: we must distinguish between established facts and speculations. Agreed: modern cosmology has established that all the matter in the Universe we can now observe was once in a hot, dense fireball about the size of the solar system. The theories describing that fireball can be extrapolated back still further. But as the radius of the ball becomes smaller, and the temperatures, densities and energies become higher, we leave established facts and enter the realms of speculation. And for the epoch at which inflation is supposed to have happened, we are most certainly far beyond the realm of established physics. Indeed, at the end of inflationary epoch (if there was one! ), the radius of the entire present observable Universe was about 1 metre — wow! But Uncle Max has another mind-bending suggestion. Some inflationary models suggest there are infinitely many such Universes, now mutually un-detectable. If so, there is nothing to stop any particular scenario, like Napoleon winning at Waterloo, being played out countless times all over the multiverse. And what goes for a scenario which you believe happened, goes just as well for scenarios which you believe did not happen. The many possible ways in which Napoleon could have won at Waterloo would also be played out in somewhere in this vast multiverse. This is giddy stuff, to be sure, and there is more. Many inflationary models of cosmology suggest, not only that there are these separated universes, but also that the laws of physics can be different in different ones. This panoply of universes, differing in their laws, as well as their particular matters of fact, Tegmark calls the level II multiverse. Physicists know of a mechanism that can lead to different laws of physics in different parts of the multiverse: it is called symmetry breaking. The idea is that a law, or collection of laws, of physics can have a symmetry, while a solution to those laws lacks it. We explore this idea further in this article. Suffice to say that one consequence of symmetry breaking is that the constants of nature, the speed of light, the strength of gravitational attraction, or the ratio of the strengths of the gravitational and electromagnetic forces, could have different values in different universes. I turn to Uncle Max's level III. It concerns the controversial many worlds interpretation of quantum mechanics — the very phrase clearly suggests a multiverse! Quantum mechanics suggests that a small particle, such as an electron, can be in several states at once. For example, it can be in several different places at once, or its momentum can have several different values (see this Plus article). When we look at the world at the macroscopic scale, however, we do not see this superposition. In the ninety years since quantum mechanics has been put into its established form this mismatch between quantum physics and our experience has not been explained. So we need a health warning here: we are again entering very speculative territory. But one of the proposed solutions yields Uncle Max's Level III multiverse. Namely, Everett's proposal (in 1957: so more than fifty years ago) that, in short, a quantum superposition represents, not a set of alternatives of which one is real, but an actual plurality of realities. Thus, the universe contains a plethora of Everettian "worlds" (also called "branches"), where each such "world" is something like the familiar macroscopic realm, with all tables, chairs etcetera in definite positions, with definite momenta. But the worlds differ among themselves about these positions and momenta. Of course, we experience only a single definite macrorealm. (See this Plus article to find out more.) So the idea is: we just happen to be in one world, rather than another one. So this is indeed a proposal for a multiverse. Welcome to Level III! And so to Tegmark's fourth and last dizzying vision. Unlike the first three Levels, this proposal is independent of the details of physics. It is distinctively philosophical: it is a claim about how mathematics describes physical reality. It is also a radical claim: namely, that physical reality is not merely is described by mathematics — but, instead, is mathematics. There is no doubt that the history of science, and especially of physics, provides countless illustrations of the power of mathematical language to describe natural phenomena. Famously, Galileo himself — the founding father of the mathematical description of motion — wrote in The Assayer (1623) that the Universe is written in the language of mathematics. Of course, since Galileo's time that language has developed enormously. If mathematics gives us so powerful a language for describing nature, why not conclude that nature is mathematics? Tegmark endorses this claim. But he also ties it to his over-arching theme of a multiverse. That is: we should believe in the equal reality of all the possible mathematical structures. Welcome to Uncle Max's Level IV! Tegmark's claim will tempt anyone who loves mathematics, but alas, I do not think it holds true on closer inspection: just as there is a distinction between the concept of a quadratic equation and a particular example of a quadratic equation, so one needs to distinguish between a mathematical structure and an object that exhibits this structure. I will look at this line of thought in more detail in this article. But whether or not one agrees with Tegmark's multilevel multiverse, one thing is certain: his book is a fascinating read. Jeremy Butterfield is a philosopher of physics at the University of Cambridge.